Works perfectly in our entry hall at our beach house The design and colors make it hard to see the sand that is brought in daily and it helps catch the sand. The rug made me do it. I'm definitely am a senior citizen and never purchased anything ever off internet. I'm one of last living dinosaur that still walks this earth! ! I not really savy on any device. But when I saw that Rug, so colorful with all my favorite colors. I wanted that rug real,real bad. I was gonna try to find someone to help me. But alias I did it all by myself. I had to have that rug. It's made well, absolutely beautiful, price I thought was fair. I'm very very happy with MY rug. I needed a small rug to match my larger Safavieh Monaco Vintage Bohemian Multicolored Distressed Rug. I recently had new Luxury Vinyl Planks placed in my house and the dogs were slipping a bit so the rugs help. The smaller rug bridges a slippery spot . Highly recommend the non slip pads. I love this rug! 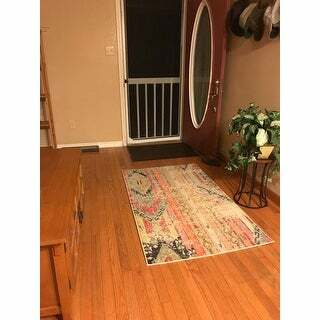 I've been looking for awhile for a rug to put by my back door that fits in with my bohemian/farmhouse taste! This works perfectly and the colors are beautiful! Highly recommend! I have purchased several sizes of this rug and smile every time I unpackage one. The colors are NOT intimidating as I had originally feared, but softly vibrant and truly allow for so many colorful accessories without overloading the room or resembling a carnival. The distressed areas are charming. My only reason for deducting one star is that it is very slippery without a mat underneath!!!! I dislike buying an item and having to buy a second item to make the original item work correctly or safely. That being said, go ahead and prepare to buy a rubberized mat to place underneath. The large rugs aren't as big of a issue since they're heavy and usually anchored by furniture, but these smaller 3x5 size will scoot out from under you in a heartbeat -- I know! Love the color, the distress, the low pile so the vacuum robot glides over it easily. Oh, and one other thing- the photos can make the dark colors appear black, but actually it is a very dark navy blue. Perception is reality, so since most of my furniture is black or charcoal grayish, everyone believes the dark color is black. Fine with me! So other than the backing problem, I am happy with my purchase. I absolutely LOVE this rug! It arrived within five days as promised, and when I unwrapped it I was pleased that it actually looked better than the picture. I had ordered it for our front entry way where we frequently track in a bit of mud and Missouri clay. I was hoping the multi color pattern would minimize the sight of a bit of dirt until the next vacuuming. I honestly didn't expect to care one way or another, but I really LOVE those colors, and the suggestion of distressed stripes and diamonds. Even my husband noticed it and was very complimentary, asked if it's a Jackson Pollock, ha. It's casual but would look great with alot of furniture styles. I tend to like Mission and Prairie but I'm sure it would look great with any farmhouse style, french country, or some contemporary styles. I've had it a couple months now, and it's still beautiful, vacuums up nicely, in spite of the cat claiming it as her new favorite resting place. Might be great in a child's room too. I'll probably order a larger one to go in front of the double doors in the daylight basement. I highly recommend this rug!! This is a great little rug. I am a loyal Safavieh shopper - they have great quality, beautiful rugs. This is in my entryway and it's nice and soft. The multi-color pattern hides high traffic use too. Love the colors and softness of this rug. Love this rug! Was looking for a rug on Overstock for my new screened-in porch and immediately found this. I wish finding a rug for my kitchen was as easy....been looking for 4 years for that! 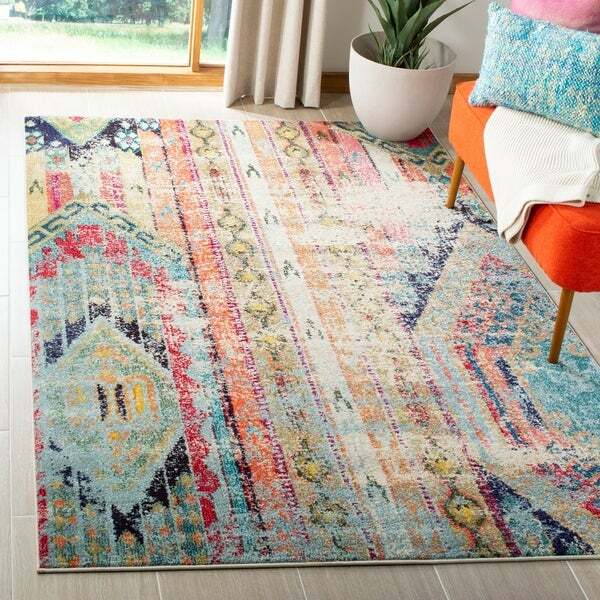 I love the muted yet colorful colors in this rug and I would say that they are not to hit you in the face bright. It is a little thin, but not noo thin, especially for my porch. I like the fact that I can just rinse it off with a water hose. This is a great rug! I purchased it for the front door so it has a lot of traffic and still looks fantastic! I liked it so much I purchased the matching rug and runner for my dining room! So many beautiful colors in it that it compliments almost any décor. Very nice. Looks like the pics. Bought these to go in my living room. They go great with the runner I purchased. Colours are muted,yet are bright enough to be a little showy.Has a nice nap and feel.Very pleased. This rug is perfection. It makes me happy every time I walk in my living room. It vacuums well. And so far hasn’t faded in the sun. I have a three year old and it still looks as good as the day I bought it. Highly recommend. Love this carpet! It's just as described. Very pretty and rustic looking. Not too distressed at all. The colors still pop and looks great in my family room. Also very easy to clean. Love my rugs. Beautiful pattern and so easy to keep clean. I have kitties and dogs. Soft and colorful, a good size. Super pretty and perfect for our space. Colors are very bright. Different than the picture. Love it! Brightens up my room! Love this rug! Soft and easy to clean. Slightly less vibrant in person but I still love it and am glad I purchased it. Works great in my kitchen. 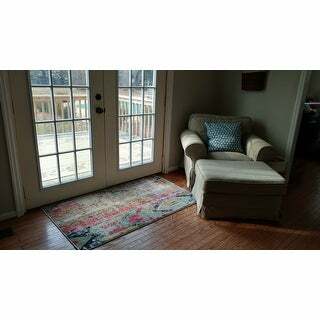 "One buyer mentioned a bad odor coming from this rug. Has anyone else noticed a bad odor?" I purchased this rug and have had no odor issues. Important to state that I am 'very' sensitive to odors ... sorry to hear you are experiencing this. BTW, absolutely love the rug! Yes, I left it out in patio for about two weeks to get rid of the smell. Initially on opening there was an odor, but I opened the window, turned the overhead fan on, and lit an apple candle; odor was gone in no time. It was minimal at best. I have ordered a few rugs and there is some odor associated with some brands, likely due to the warehousing and plastic wrap around these items. Open the window, turn on a fan and light a candle is my best suggestion. Simple solution. Hope that eases your purchase. Mine was great! "Is there yellow/gold in the rug? It appears so, but not in description. I want yellow/gold accents in my room and wonder if this will help tie in?" Yes, there are splashes of yellow in the rug. No yellow in this rug, more like dark gold, almost olive green. Still love it. "So this could be used as a hall runner?" This can be used a s hall runner, however, we recommend the use of a non-skid pad to keep the rug in place on smooth surfaces. "Is this machine washable? Can it be spot cleaned?" "I see that the description says pink but the colors on my computer look more red. Which color is it? It is more hot pink or red?" It is closer to a magenta/pink.